Dogs shed hair and shedding is a natural process that a dog goes through to remove dead and unwanted hair. Old fur falls out, and new fur grows in its place. 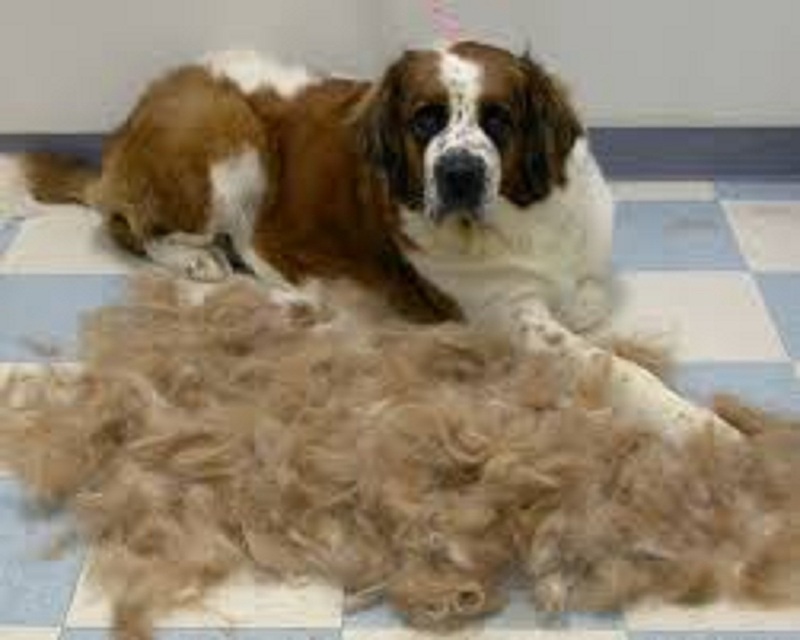 All dogs lose hair from time to time, just like humans do, but some dogs shed more than others. Dogs that live in the wild remove dead hair by rubbing up against trees and plants. Household dogs are not always able to accomplish this, so they rely on us, their owners, to help them remove excess hair. Shedding can be a nuisance to some dog owners, especially if their dog lives primarily indoors. Although there is no way to stop a dog from shedding altogether, there are ways to reduce the amount of fur that a dog sheds. Stages of new hair growth. New hair grows in three cycles. The first stage, anagen, is the period when the hair follicles are active. Dog fur is in this stage about 90 percent of the time. Next comes catagen, which is after the hair has grown to a pre-determined length. The hair is in a temporary state of transition at this time. Finally, there is telogen, which is when the hair rests or stops growing. Not all fur is in the same stage at the same time. There are times when a dog's coat can be in multiple stages. The shedding process depends on factors such as environment, nutrition, and heredity. Temperature and sunlight are also factors. Dogs that are exposed to the same temperature all year long, such as indoor dogs, may shed all year long, whereas dogs that live outdoors tend to shed only in the spring. When a dog gets older or becomes ill, shedding patterns may change. In addition, some female dogs may shed more after a heat cycle, especially when they are around 3 or 4 years old. Puppies have fuzzy hair that often does not turn into an adult coat until they have reached 5 months old. For dogs that are considered "non-shedding," their hair growth is much slower than other dogs. In addition, when the dog does shed, only a few hairs are shed at a time. • Brush your dog regularly to remove excess fur. This will keep the fur from flying all over the house. Brushing your dog also keep his fur softer and cleaner. There is nothing wrong with brushing daily, especially if your dog needs it and enjoys it. • Give your dog a bath regularly, especially in the summer months. Bathing cleans your dog's fur, which reduces shedding. An oatmeal shampoo used weekly can help make your dog's dull coat much shinier. • Make sure your dog eats a high-quality dog food. Everything your dog eats is reflected in his coat. A shiny coat is the result of good food. Bald spots and excessive shedding can be caused by a poor diet. If your dog has allergies, it may be a bit more difficult to find a dog food that your dog can eat without causing irritation. • Make sure your dog is protected against fleas and ticks. These parasites can cause scratching and bald patches on your dog's fur. Flea and tick preventatives should be applied to your dog's skin monthly to keep parasites and their eggs of your dog. • Vacuum your home often. Keeping your home vacuumed and swept daily is the best way to keep hair out of the home. Try to keep your dog off furniture, as dog hair can be tricky to remove from upholstery. If this is impossible, cover the couch or seats with throws that can be easily washed. This will keep your furniture looking and smelling good. • Regular vet visits can help detect any health problems that can lead to skin and coat issues. While you're there, you may want to ask your vet about the use of supplements. Fatty acids help promote a shiny coat.